Headlines Fishing options are still excellent if we can just be rid of the strong winds. 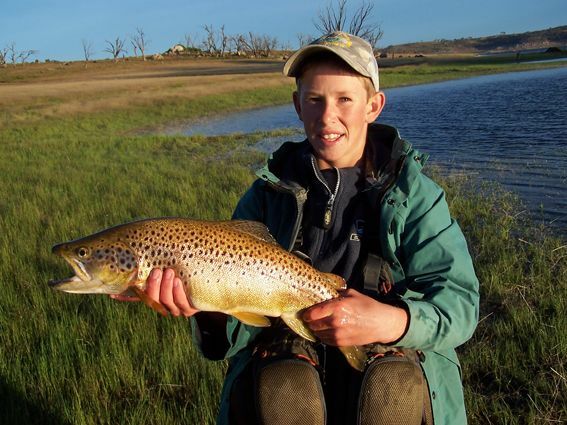 Jindabyne and Eucumbene have been the pick of the lakes with some good browns showing amongst numbers of rainbows. Normal trading hours continue after this time. Rivers:- Stream levels have been very good over the past week or so with som nice fishing to be had when the weather allows. 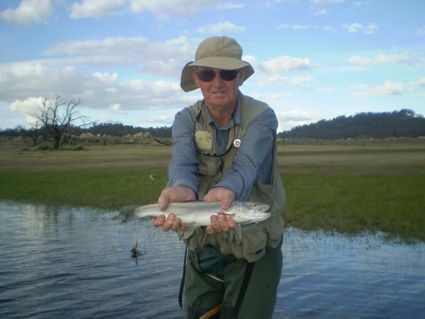 Thredbo and Eucumbene rivers are at a very fishable level and will and have produced some great dry fly action. The weekend just gone was very tough with the cool and windy conditions but even then some nice mayfly activity on the Eucumbene produced some fun fishing. The Thredbo level has been varying with the rain but still very fishable and if you can jag some good weather will produce some great dry fly action. Other streams worth propecting are the Moonbah, Gungarlin, Little Thredbo, Snowy and Murrumbidgee. Plenty of rainbows have been caught of late and while fish condition has not been as fantastic the sheer numbers of fish moving and being caught have made up for it. Fast stripped or slowly worked beadhead nymphs are working well during the day on rainbows, with stick caddis, midge pupa or unweighted nymphs working well during the evenings. 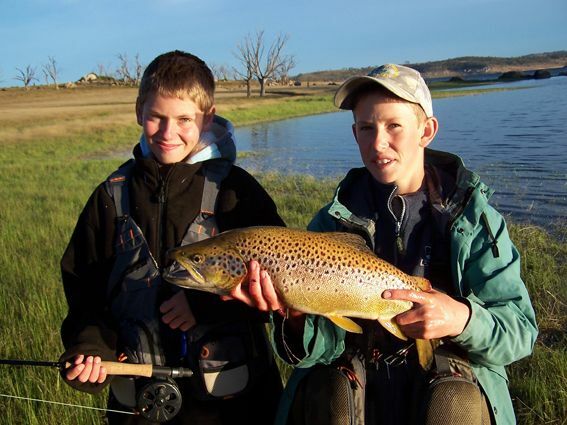 *The Jones boys, Ron, Jack (14yrs) and Ryan (12yrs) made the trip down from their bass waters of Central NSW to fish Lake Eucumbene for the very first time over the past week. To say they had a great trip would be something of an understatement especially considering they had never ever fly fished for trout before. They all landed their first rainbows on fly with the total landed numbering in the vicinity of fifty for the week between them. Jack with a couple of his rainbows from Buckenderra. Ryan landed a swag of nice rainbows and also caught his first ever brown trout and it was a fantastic fish weighing a little over 2kg. A top effort in anyones book. Unweighted nymphs in olive and black were the best flies overall especially when stripped with a fast retrieve. The majority of the fish were released with the few kept having daphnea in their stomachs. *Mick Patton had a great session alongside Russell Rose from Canberra last week. Mick landed fourteen rainbows in a three hour session. Beadhead nymphs were the pick of the flies. Russell gleaned a couple of retrieve tips off Mick and proceeded to land eight in a short time. A good time for both of them. *I had a quick look after work last Friday and found some fish despite the strong westerly blowing. Landed six on unweighted black nymphs cast at fish that were rising to emerging caddis. None were worth keeping but still better to catch than nothing. 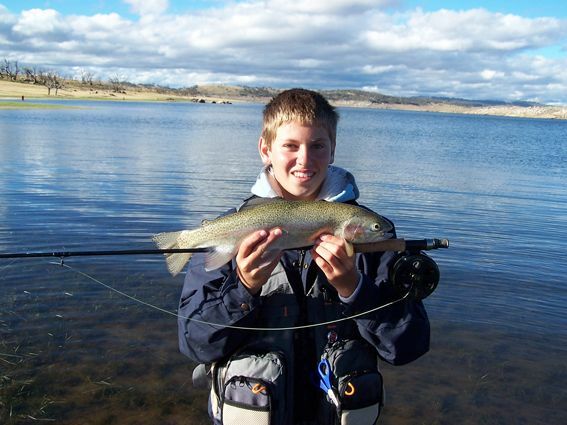 Lake Jindabyne:- Jindabyne reports have been quiet over the past week. Water temps have dropped a few degrees and the lake is very fishable at present. Midges are prevalent and if you can find a calmer bay and some less windy days the fishing can be good. *I fished again in strong winds and rain on Sunday for several hits on a bead head nymph fished with a slow figure eight retrieve. I only managed to hook the one fish which was an excellently conditioned rainbow. Again crap conditions made fishing tough and I really think on the right day this lake will fire. The rainbow quality is certainly much better in Jindabyne than Eucumbene. 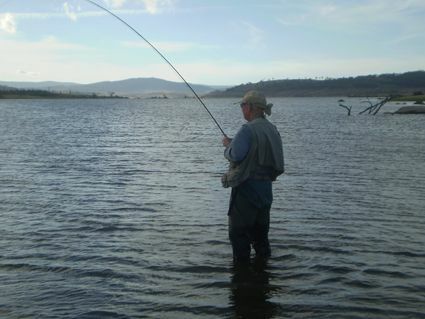 Lake Tantangara :- Has risen again this week and the fishing has been hit and miss with the weather. There are numbers of midge there and some really quality fish but finding some that are feeding consistantly has been hard. Hopefully the lake will start to fish a little better as it settles from all the rain. Eucumbene:- Eucumbene trolling reports have been better with both flat lining and leadcore working well. Best areas have been out the front of Cobrabald in deeper water with small minnows on leadcore. Tassies have been working very well in the early hours in close. Most of the fish being caught have been rainbows but there is always the chance of a brown. *Steve Grace from Sydney had a good few hours last week landing eight rainbows on tassies in brown frog and holographic colours. Sting cobra #10 also caught a couple. Best area was around the Coppermine bay area. Jindabyne:- Trolling reports have been scarce though Mick and Rowley had a good couple of sessions landing rainbows to 1.5kg recently. Downrigging tassies will produce some great fish and keep an eye out on the sounder for any daphnea blooms as these are great fish magnets and the rainbows in particular have been feeding on these blooms. 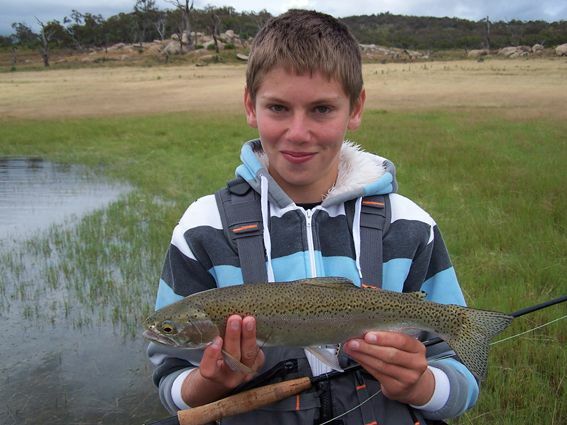 Mudeye fishing has improved dramatically with both rainbows and browns being caught on them. We have in stock good numbers of mudeyes and look set to have supply over the coming weeks. Several reports from the Cobrabald area have filtered through with some nice fish being taken on mudeyes early and late in the day. A number of quality browns have come in from this area. "doesn't matter what colour they are eating all of them"
Jindabyne has also fished well with plenty of good fishing to be had. Deeper water with Powerbait has been turning up some fat rainbows while those drifting mudeyes have also done well. Some chunky brook trout and browns have been getting into the mudeyes too. Curiosity rocks Creel bay and Kalkite have been good areas. The new Gulp Crickets are now in stock and will make a great substitute for a mudeye under a bubble. They look just like a mudeye so with a few colour choices and built in scent it would be amazing if they don't account for a few feisty rainbows and browns in the lakes. Hope everyone has a safe and happy Christmas and a little bit of luck out on the water.